Hepar Sulphuris Calcareum 30C, approx. 80 pellets (Boiron) - Penn Herb Co. Ltd.
Hepar sulphuris calcareum is indicated for painful and hoarse dry cough worsened by cold weather. Homeopathy is a therapeutic method that uses highly diluted natural substances to relieve symptoms. Homeopathic medicines stimulate the body’s physiological reactions that restore health, with a very low risk of side effects due to the use of micro-doses. 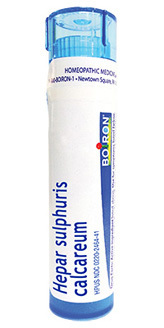 ACTIVE INGREDIENT: Hepar sulphuris calcareum 30C HPUS. INACTIVE INGREDIENTS: Lactose, Sucrose. The letters HPUS indicate that this ingredient is officially included in the Homeopathic Pharmacopœia of the United States. Painful and hoarse dry cough worsened by cold weather. Adult and children 2 years of age and older: 5 pellets 3 times a day until symptoms are relieved. WARNINGS: Stop use and ask a doctor if symptoms persist for more than 3 days or worsen. If pregnant or breast-feeding, ask a health professional before use.